It’s that day on Real Steel when we announce the finalists to our contest. The five finalists—Blade of Ancient Visions, Cutlass of the Eldritch Deeps, Cutlass of the Shattered Mind, Eye of the Deep One, and R’lyeh’s Gaze—are listed below. Please, vote for your favorite in the poll at the end. Polls close on May 23, 2016. 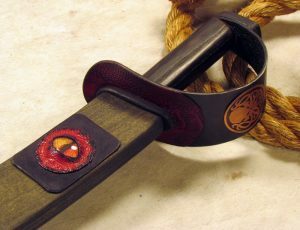 The leather cup guard of this blade is made of some strange, squamous hide, and emblazoned with a copper disk sporting a monstrous, tentacled head. A similar head is attached to one side of the dark-stained wooden scabbard, while the other side is set with a monstrous, yellow glass eye. Both blade and scabbard have a dank, briny smell about them. You gain a +3 bonus to attack and damage rolls made with this weapon. The blade of the cutlass appears pitted and corroded, but is immune to corrosion, such as acid or a rust monster’s Rust Metal trait. When you hit a creature of lawful alignment with this magic weapon, that creature takes an extra 2d6 necrotic damage. Once per day, you can command the glass eye upon the scabbard to become a glaring, viscid thing that turns its terrible gaze upon your enemies. Each creature of your choice in a 20-foot cone must succeed on a DC 15 Charisma saving throw or suffer a random short-term madness for 1 minute. Quirk. If you remain in a region for more than a day, the weather turns gloomy. This does not bring violent weather, just unseasonable drops in temperature, fog, clouds, light rain, and similar dreary weather. Curse. This cutlass is cursed, and becoming attuned to it extends the curse to you. As long as you remain cursed, you are unwilling to part with the cutlass, keeping it within reach at all times. The weapon attracts the attention of evil, aquatic creatures. The chances for random encounters with such creatures are doubled. In encounters, such creatures will attack you in preference to other targets and will attempt to take the cutlass for themselves if they are able. This cutlass was forged from an alien alloy engineered to absorb psychic energy. The heated psychic metal was then quenched in the ichor of an elder entity of the Far Realm, infusing the blade with a trace of the being’s incomprehensible power. Untold centuries later, the cutlass was bought off of a deranged sailor who claimed he found it in the ruins of a city sleeping on the ocean floor. Perhaps other wonders lay hidden there, or perhaps the old sailor simply imagined the city in a fit of delirium. You gain a +2 bonus to attack and damage rolls made with this weapon. Exsanguinated Whispers. Any creature you hit with this weapon must make a DC 13 Charisma saving throw. If the creature fails, you may access a specified snippet of information from the creature’s mind. If the save is successful, you access a random thought, memory, or impression instead. Curse. Whenever you are holding the unsheathed cutlass, the GM can have you roll a d20, but not more than once per hour. If you roll a 1, glimpses of the horrifically alien Far Realm haunt you for 1d4 minutes. You are stunned for the duration. When the effect ends, you must make a DC 17 Charisma saving throw or become permanently insane (the GM can assign an affliction or roll on the “Indefinite Madness” table of the Dungeon Master’s Guide). It is possible to gain more than one affliction in this manner. The madness can only be healed by a greater restoration spell or comparably potent magic. This cutlass was once the prized blade of an infamous pirate whose ship sank under the Sea of Madness. The sword spent centuries buried under the waves, engulfed in the seeping chaotic energies of the beings that lurk in those waters. No one knows how it found its way back to civilization, but now it moves from wielder to wielder, driving its bearers insane even as it serves as a herald of the Deep One’s return. When you take a long rest, you may sprout up to five tentacles from your body, which last until your next long rest. For each tentacle you have, your Wisdom and Charisma scores are reduced by 2 until your next long rest. These ability reductions can’t be recovered by any other means as long as you have tentacles. If your Wisdom or Charisma score falls to 0 or lower, you become permanently insane and turn into an NPC under the DM’s control. A tentacle is a natural melee weapon with 10 ft reach which deals 1d4 magical bludgeoning damage. You are proficient with your own tentacles and may add your Strength or Dexterity modifier to their attack and damage. You can use tentacles as limbs to grapple, shove, or pick up objects (within reason). However, they cannot be used for actions that require fine motor control, such as writing or bearing weapons or shields. When you take the Attack action on your turn to attack with Eye of the Deep One, you may also attack with all of your tentacles as part of that same action. Curse. R’lyeh’s Gaze is often mistaken as an enchanted weapon, but the truth is far more insidious. It is a spiritual corruption, a curse transferred upon death to the nearest sentient being (typically the victim’s slayer). It takes time to bear its full effect and as it does, R’lyeh’s Gaze manifests its changes upon the victim’s favorite weapon. The corruption comes in stages, starting with transference. Transference. (Wisdom DC 18) Upon contracting R’lyeh’s Gaze, the victim loses the ability to sleep peacefully for four nights. During this time, any attempt to sleep brings horrific nightmares and paranoia. The victim suffers a cumulative penalty of -1 to all Wisdom saving throws per night. While holding this weapon, you are immune to mind-affecting spells and effects. If you die, this weapon rots away into nothingness. Blade of Ancient Visions is an excellent example of narrative use of the mechanics. While the drawbacks for using this powerful artifact may not be immediately tangible, it will leave a scar on the character that promises a lifetime of Lovecraftian terror.